What started as any normal day turned out to be one of the biggest adventure, courtesy some people whose �blind beliefs� led to one incident after the other. Especially writing down this article. From the diary of a rescuer, an incident which forever has left a mark inside about how good/bad people can be following their blind beliefs with no meaning behind it. One small decision can change so many things, just one small decision. In today�s time people need the fastest SUV�s, the fastest 3G mobiles, fastest tablets, fastest internet but the thinking and belief is always the same old background one. As an ad says it is indeed an �Incredible India�. It was the 14th of October, 2014 somewhere in the evening received a message on our Volunteers Whatsap group from Suma mam that there is an Owl, who is stuck in a bathroom at a Residential Apartment at Kulshekhar near the famous under construction Lotus Mall. Immediately reached the place in about 20 minutes and met the person who had reported it. The reason I don�t want to mention further details about the people who reported shall be automatically known to you all later. The first thing I got to hear is the Security fellow saying �Its impossible sir, even Pilikula people cant do it�. Before I could say anything the reporter came down and took me to the flat and showed me the place. It was on the 2nd floor and it was a duct behind the bathroom that we normally have in Apartment buildings whereby a common duct is given for all the bathrooms probably for ventilation and air flow etc but people use it to throw cigarette buds, packets and bottles of shampoo, old razors and things which I can't really mention here (Kids would be reading too). The passage was about 1.5 feet in width and 4 feet in length(Smaller than the size of a grave). Tried searching and since was unequipped with any torch or tools had to decide on coming the next morning when the owl would be inactive as these are nocturnal birds. -My gym Hand gloves to catch him in case if he is a little aggressive. The last time there was an injured Brahminy Kite I had rescued from Bunder and Dr Lakshmi had said their claws are so strong if they perch on you the only way we could get them off is by sedating the birds. So didn't want to take that chance..!! So with all said and done we entered the bathroom and the owners gave us an introduction about how they moved to Mangalore, about their love for animals, 8 cats, a dog and some birds they had, so on and so forth. And in the end comes the twist. In their own words.� We have consulted many people regarding the owl from October 14 and even our priest, they say the owl is a bad omen. It means something very bad will happen if it comes inside and we will have to vacate the place and go away so make sure you don�t get him inside�. I was dumbstruck for 2 minutes hearing this. I mean people still believe all this? Whatever, didn't have the time to think on it so keeping everything aside Kiran and me went inside the bathroom and locked it from in as per their directions given to us. Removed the glass slabs one by one and slowly sneaked in and there it was�!!! The pretty face with sleepy eyes staring directly at the torch. As we know owls can't see properly in the day so it was trying to look up with his teeny weeny eyes what on earth is going on here. The thing here was the poor fellow had fallen into the duct from the 10th floor and it was not able to fly up and go back as the duct is too narrow for him to spread his wings. And that�s how it was stuck there. Tried many different things but again the main culprit was the size of the duct. Sometimes my shoulders would get stuck and sometimes my waist. Although the owl was quite silent it could anytime sense a threat and attack us out of panic. No matter how cute a bird looks they still can punch in a solid bite and give scars to heal forever and that thought didn't give us enough courage to directly put our hands onto it. Tired and exhausted I got out of the death hole and Kiran went in. The same process repeated and he had to come out too. We were just too badly tired now so Kiran wore my gloves and decided to take a shot on catching with hands. 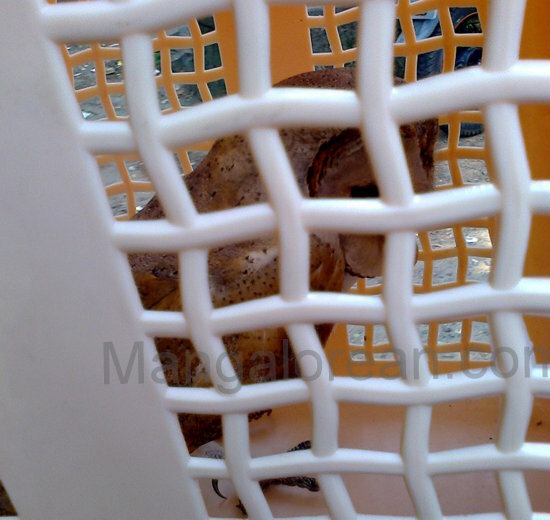 After a little struggle and putting up a small fight the owl gave up and kiran caught a wing and we immediately shifted him in the basket�Phew..!!! Happily we thought our work done its just that we have to take him out now. It was 12 O' clock and we had spent 2 hours on this already and realized the owners were more than adamant than they were before now. There was a balcony next to the bathroom and we requested them that we could tie a rope and take the basket down but they had other plans. The only option we were left to save the innocent soul was put down a rope from the 10th floor i.e from the terrace of the building uptill the 2nd floor and tie the basket and pull it upwards like the way we draw water from wells. So now this was another challenge, not because we had to do another task but because we were not equipped with a rope which is atleast 25 metres long plus the basket wouldn't pass through the duct easily as there were many rods in between which obstructed smooth movement. And this is how you make a 2 minutes task of getting the owl out of the house into an hours work. So now we needed a narrow basket something like a dustbin so came out of the building and went searching for one. Got a shop whom Kiran knew and after some searching found the perfect one with a lid. Bought a red coloured basket for Rs.200 and told the shopkeeper the purpose and told him to make some holes in it so that the bird could breathe in peacefully during the entire process. Went back to the flat and shifted the bird somehow into the new basket and tied it, so that it doesn�t open up. Immediately rushed to the terrace on 10th floor with the rope Kiran had brought from his home during all this. He let the rope go down the duct and I went down and tied it to the owls basket and gave a green signal to be pulled up. And finally the pretty sleepy eyed bird was out of the death hole. Untied the rope and took the bird down and shifted it to our bigger rescue basket where it could be free and move around. The little one was so happy probably for 2 reasons, one it was out of the dungeon it was stuck in from don�t know how many days and second it had a bigger place to flutter it's wings, see new things apart from walls and breathe fresh air apart from the dirty smells it used to get all these days stuck near toilets..!! Collected all our things and left the place with such a big heave of relief. Kiran was driving and while holding the basket one thing that I observed the owl was indeed looking around at passing things just like a human child would do. And infact when I was saying this to Kiran that he maybe so happy his head just turned towards us and I don�t know what was happening but the owl just looked straight into my eyes for about 10 seconds. I don�t know if it was a co-incidence or what but that connection spoke so many things without any words being spoken. It was not a normal stare nor a look of vengeance, it was something beyond that.. it was a look of gratitude I felt, an unspoken thank you maybe..maybe it was saying inside, �Without you 2 humans putting up so much of effort I wouldn�t have made it..I had almost given up hope in life when I saw a ray of light when you entered..a poor bird like me cannot offer you anything in return but I hope you are blessed from the almighty..Thank you so much I will always be indebted to you�. I really don�t know what it was but was very mystical and mesmerizing. Have had similar eye contacts with little ones we have rescued before but this was special..very special indeed.. If able to put its feelings into words it would probably cry and tell us how bad it feels to be tagged as a �Foul Omen�..�Saawina Sutaka�..�Shani� and what not. I have no idea from where these nonsensical things have been imagined and woven into stories about such things. Every bird and animal is a creation of the almighty and its us the evil humans who have tagged each one of them with such things. No matter how educated our people are deep inside they will always be uneducated with such baseless beliefs in them. God almighty has created us all equal. Humans are indeed the most smartest and powerful ones so why not use this special gift of God to help the weaker ones. There are plenty of needy ones around, it just takes little care and love to spread our arms and take them all in, Isn't it?? All aside we reached the Animal Care shelter and had its physical examination done and it was pronounced to be healthy. It was just exhausted and tired so we let it sleep and wait for it to get active in the evening so we could feed it some food. We have requested it to be our �Guest of honour� and it will rest for the night with us and shall be released back tomorrow evening in some trees nearby where it was rescued from so that it can rejoin its family and lead a normal life once again. And yes, it will be staying inside the house..indeed..we are not scared because it is not evil, just another bird whom we love and shall always love. Next time anybody needs assistance like today please respect the work the volunteers do for you. Please do not think we are �dog catchers from the municipality� and that�s what we do. We are not..even we are professionals who are into business, do our jobs and whatever little time we find we dedicate our services only for the sake of helping the voiceless. Kiran is a team leader at his work place and I have my real estate business. Please do not tag us as we are here to clean your mess. When people have kept aside their work and dedicated their time for a noble cause please help them a little too, by a little co-operation. We were definitely not expecting anything in return for what we did as it was for all our love for the little one but atleast the expenses of the basket and the net could have been paid as we had to buy them only because of their blind belief. Forget the expenses atleast a couple of words of gratitude would also do..but no..So next time you meet somebody who is there to help please co-operate and don�t make life difficult for them after all whatever we do is honorary service. I hope we can all change..our thinking can change..the way we look at others and our perspectives change..I really hope so..